Credit Suisse is a leading financial services company in private banking, investment banking, and asset management. Founded in 1856, Credit Suisse currently employs over 47,400 people working in 550 offices in 50 countries. Through its commitment to global carbon neutrality and participation in dialogues about climate change, Credit Suisse has demonstrated a willingness to engage in finding solutions. Credit Suisse Global Environmental Affairs worked alongside Earthwatch scientists at the Regional Climate Center in Brazil. The next year, Credit Suisse employees participated in Earthwatch expeditions in the Dinghushan Nature Reserve of China and coffee plantations of San Marcos de Tarrazú in Costa Rica to assist scientists in environmental research enhancing their understanding of climate change and sustainability. Conducting climate change research in the French Alps. 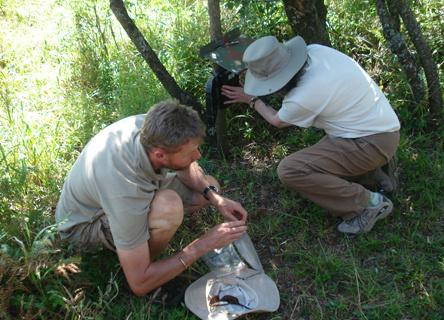 Credit Suisse employees have worked alongside Earthwatch scientists on critical environmental research projects around the world. In 2013, six Credit Suisse employees will travel to France to conduct climate change research in the Alps. The partnership continues to engage Credit Suisse employees in powerful, hands-on professional development, such as team-building, problem-solving, and intellectual challenges, through the framework of environmental stewardship and sustainability. Upon return, each of the participants will share his or her knowledge and experience among colleagues, contributing to the overall sustainability strategy at Credit Suisse. In addition to these six fellows, Credit Suisse has expanded the program in 2013 to offer three one-day ClimateWatch expeditions in Hong Kong, expanding the reach of the program to more employees and enabling their staff to learn about the issues surrounding climate change and research methods in their local community. 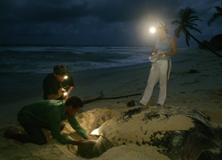 Helping conserve Trinidad's leatherback sea turtles. 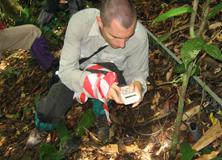 Studying climate and landscape change in Borneo's rainforest. EY professionals gain hands on experience with both science and the business of sustainability through the EY-Earthwatch Ambassadors Program. 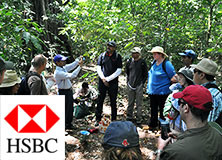 HSBC’s Sustainability Leadership Program is a unique professional development experience for senior leaders, designed to promote understanding of sustainability as a core business issue and opportunity. Coral Communities in the Seychelles began in 2006 to assess the impact of climate change on coral reefs and informing plans to help safeguard these precious ecosystems and the communities that depend on them. 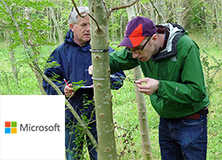 Microsoft employees exchange the office for Oxfordshire’s Paradise Woods to take part in Earthwatch’s innovative one-day employee engagement program. 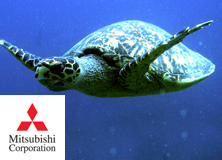 Earthwatch and Starbucks have partnered to support scientific research and employee engagement. Together, they’ve promoted sustainable farming practices in one of the world’s premier coffee-growing regions.